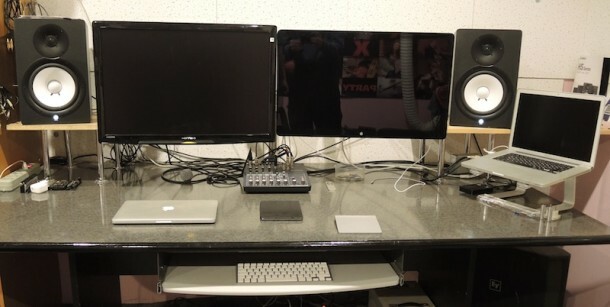 Tell us a bit about what you do why this specific Mac setup? I am a Music producer, and so I’ve built my setup solely for music editing and production. What hardware is included in the Mac setup? My main machine is MacBook Pro 15″ (Late 2011 model) in max configuration with matte display, 16GB RAM and OCZ Vertex 4 SSD . The MacBook Pro sits on a Griffin Elevator Laptop Stand . 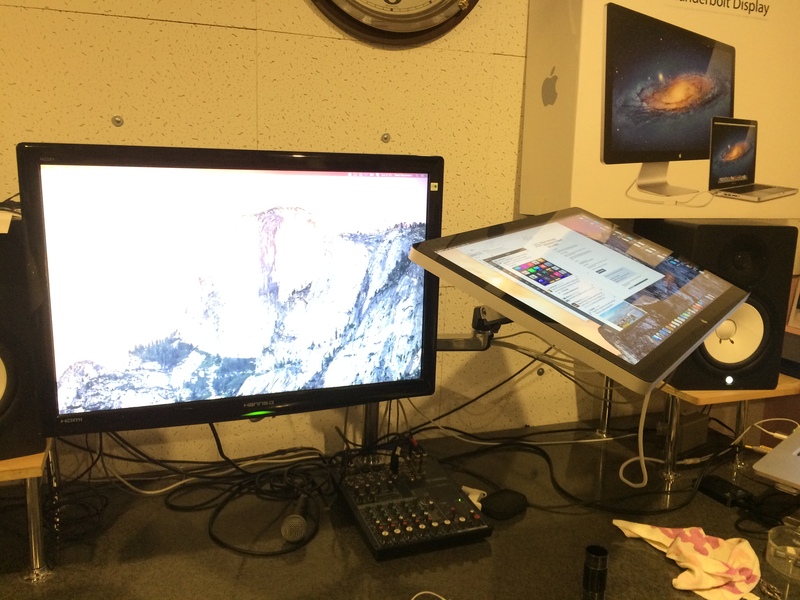 I use two displays mounted on a double arm mount from Ergotron, it works perfectly with my Apple 27″ Thunderbolt Display and Hanns-G 28” monitor. I have M-Audio ProFire 2626 FireWire and M-Audio Octane microphone pre-amps. My main speakers are Yamaha HS8 Studio Monitors . My peripherals include Apple Magic Trackpad and Apple Wireless keyboard. There’s a Lacie ThunderBolt to e-sata hub and 2 TB Sata HDD as my external storage solution, which also powers my second display. I use my base MacBook Pro 13” (late 2012 model) when I’m on the go. My main app for music editing is Logic Pro X. I use it because it integrates well with Apple hardware and is easy to learn. And basically I use most of Apple’s other included software as I have other Apple devices. Do you have any tips you want to share with OSXDaily readers? Read reviews of every single new device you want to add to your setup before buying it. Good luck! Want to share your Mac setup? Go here to get started! And if you just want to browse through other Mac setups, then you can do that too! What’s the soundproofing on the walls? Does it make me the sound better or stop reverb? WRONG!!!!! Plus you don’t have ANY acoustic treatment to reduce mid/high reflections and have a highly reflective work surface. There is NOTHING pro about this setup at all. Thats about as pro as the guys who drive around with tools in their trunk stopping people who need bodywork done. No acoustic treatment, a desk that is reflecting everywhere, might as well be mixing in a can there is zero accuracy acoustically in that setup at all. Definitely not remotely “pro” in any way. Sorry dude, not professional. My kitchen is better equipped to use Logic than your workstation. Great story, what do you do for a living? Criticize people anonymously on the internet from your moms well equipped kitchen? I bet that is rewarding. Its a shambles, how can anyone work like this, no cable management, monitors odd sizes, if he can afford these monitors at least get 2 matching! I take offense to the people insulting this guy by saying this is not a pro setup. My friend who is an engineer won a Grammy a couple of years ago as the engineer for a well known artist. He mixed most of the album using Pro Tools on a MacBook Pro, with Lynx or Prism converters and good headphones. Of course some of the tracking and mixing was done at a well known studio with the requisite board and other million dollar sundries. But would a studio like that be the point of this series? No, I don’t think so. Acoustic treatment is so overrated. Artisty and ability is within the individual, not the “perfectly tuned room”. This guy could be a composer for a well known TV show. He doesn’t need acoustic treatment for that job. He just needs to be able to compose, notate and crank out MIDI mockups. So quit being such jerks. I like this series a lot and want to see more. The people cranking about the hardware not being ‘pro’ are probably from another era where a studio was some twenty million dollar creation on 5th avenue. That’s not necessary anymore. Your MacBook Pro is a recording studio now, deal with it. 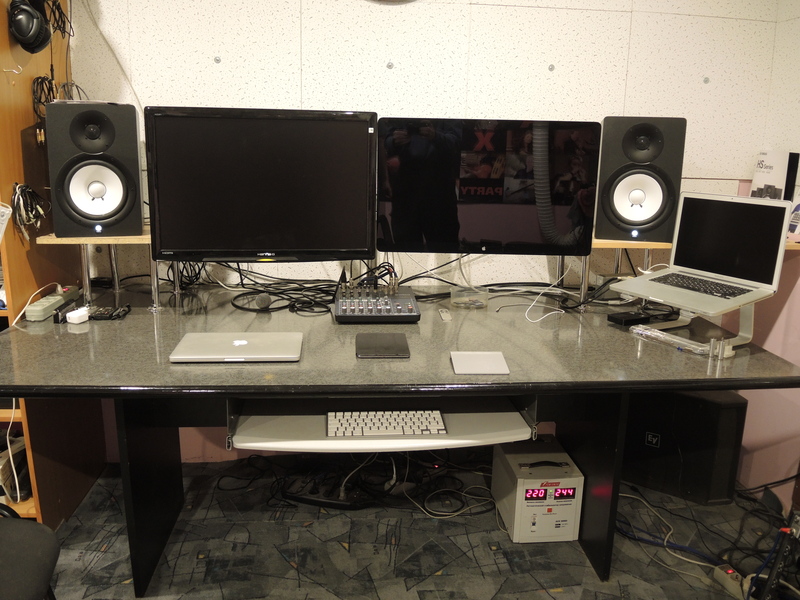 Many pop artists and musicians have minimal setups. You complaining commenters have no idea what you’re talking about and you’re probably 12 years old with no experience making anything. Here’s a famous recording studio in LA that looks like someones living room, you going to say they aren’t pro too? And watch out you complainers, some of that music in your Spotify stream is being produced in someones basement with a MacBook Pro and Logic. Deal with it. Welcome to 2015. Hey I am a hobbiest with Mac audio, and I have a dual display setup. But one of those displays is an SM124 monitor connected to an Atari ST. Do I win? Shall I end a photo? Acoustic treatment is crucial to an accurate monitoring environment, without it there is NO WAY you can accurately mix, since the mix environment is not accurate. ANY “professional” knows this, basic audio 101. I am a professional and I have won Grammy’s and other professional awards for my professional work. 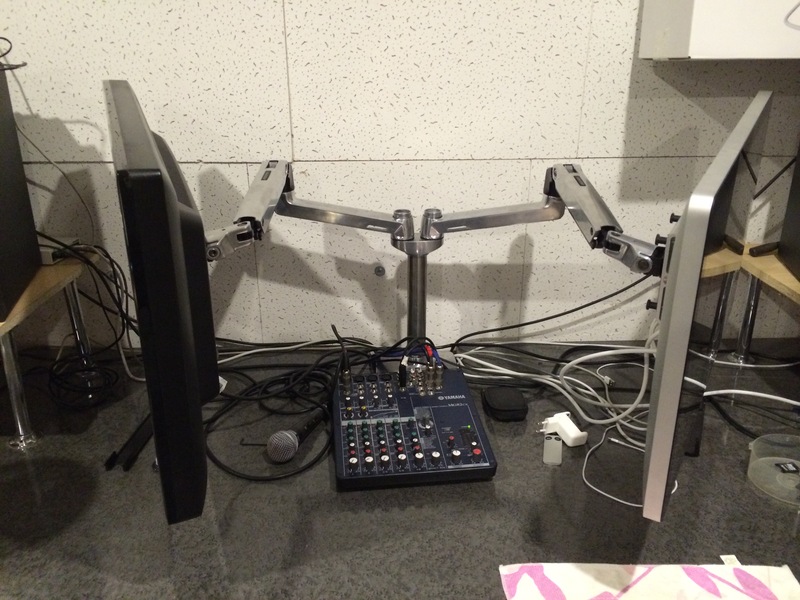 This is NOT a professional setup in any way. Wow you have won a Grammy award? For what album or production? That’s amazing, I would love to see the Mac setup of a Grammy award winner! This isn’t about who has the coolest stuff or the most professional setup, it’s just about people displaying their creative work environment so that others can get ideas and build upon their own setups. I actually find a lot of new apps that become useful for me from these articles and how people use them. So just chill out and let people have their moment.